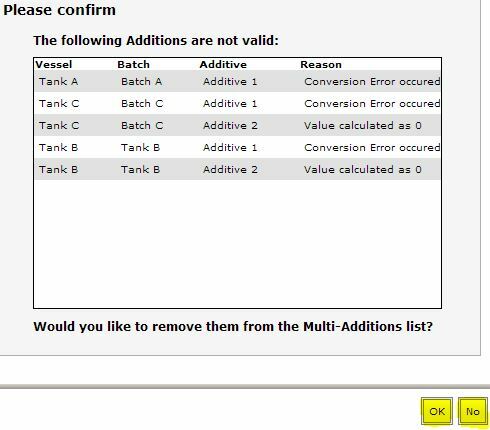 The Multi-Additions can now support multiple vessels per operation, with multiple additives per vessel. It is designed to be flexible to accommodate for a large range of uses; ranging from the large monthly additions to smaller operations with only a few additions. 1. Create/Select an Additive Template. If you are unfamiliar with the Additive Templates you can read up on Target Rates. The Additive template is used for each wine product added to the operation. 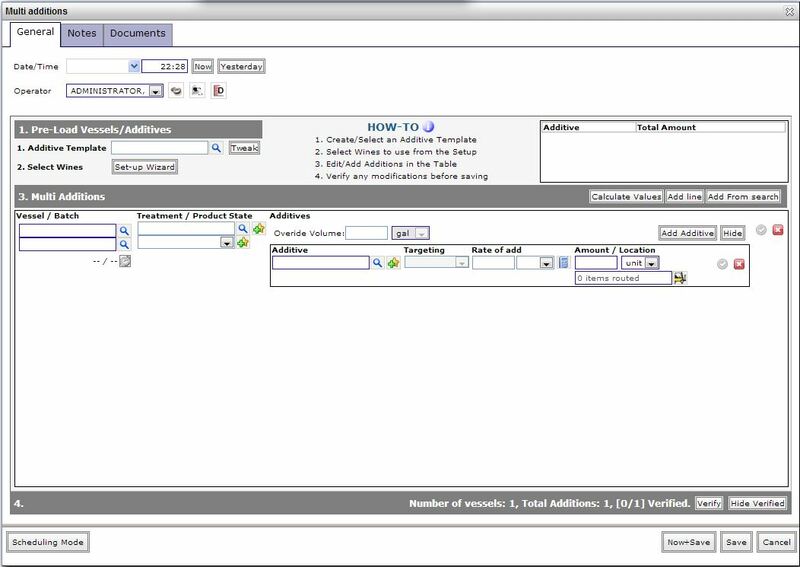 It is required in order to continue with the Setup Wizard, as it is needed to calculate the total amount of the additives. You can Create a Temporary Template, or ‘Tweak’ a selected Additive Template to use temporarily for this operation. Modifying/Tweaking a template: Modify additions/values based on an existing template that will be used for each of the added wine products. This will not affect the selected Additive Template and the modified template will only exist for the current operation. Creating a Temporary Template: Add the additives you wish to use as a template for the operation. The Template does not get saved at the end of the operation; though if you find that you are creating the same temporary template multiple times, it’ll be simpler to actually create the Template from the winery setup. The Setup Wizard aims to make filling out the Multi-Additions table easier. 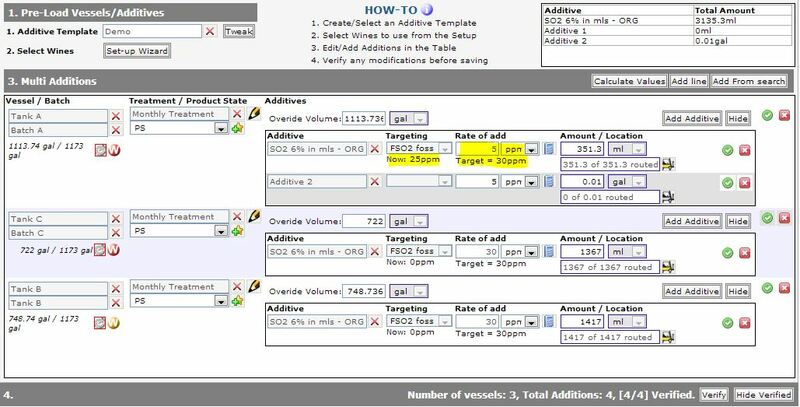 The Setup will calculate the amount of additive needed for each wine based on the selected Wines and the Additive Template. The setup will detect any errors and ask if you want to remove them before loading the data into the Multi-Additions table. The wizard will bring you to the following Selecting Wines form. Keep using the product search until you have added all the selected wines before continuing. 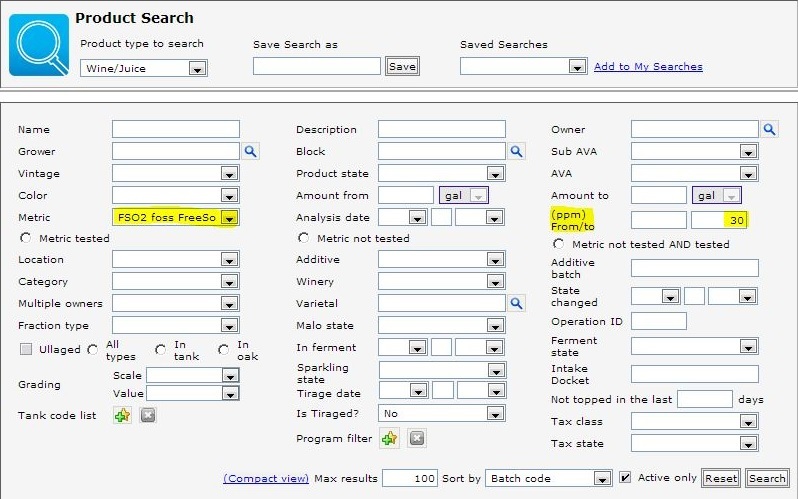 Helpful Product Search Tip: If you are using a Template that has a Target rate, you can use the Product Search to help find wines that are under the targeted rate. The Summary shows the total amount of the Additive calculated from the selected vessels and template. Users who have the MRP module can also choose where the Additive stock item is routed from and Non MRP users can select which Lot to use. If there were errors in the calculation then it will not contribute towards the total amount. In the example above there is no amount set for ‘Additive 1’ as it couldn’t be calculated. OK: Generates the Multi-Additions table with the selected wines and pre-fills all the addition’s information. It will also notify you of any errors (as shown below). Skip: Generates the Multi-Additions table with the selected wines and uses the Additive template to pre-fill the additions, though it does not fill in the calculated amount. This is useful when scheduling the operation and wouldn’t know the correct rates/amounts etc. 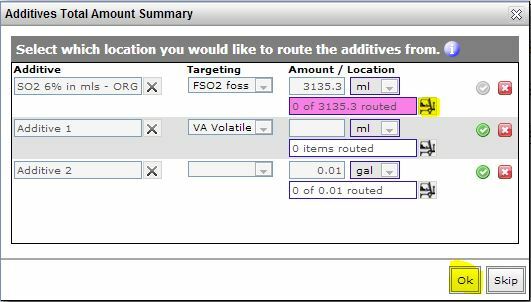 Once you are done with the summary, clicking OK will display any errors the Setup found while calculating the Additive amounts. Here you have the option of removing them all from the Multi-Additions list, or you could choose to keep them. You can then modify or remove them individually in the Multi-Additions table. The Additive was not set up in the system properly, which caused the conversion error to occur. If you need help setting up Additives look at additives, metrics or contact support. Use the Multi-Additions table to add/edit/remove wines and additions. Add more Wines by clicking Add Line or Add From Search at the top of the table. Add more Additions by clicking on Add Additive for the Wine you wish to apply an extra additive to. 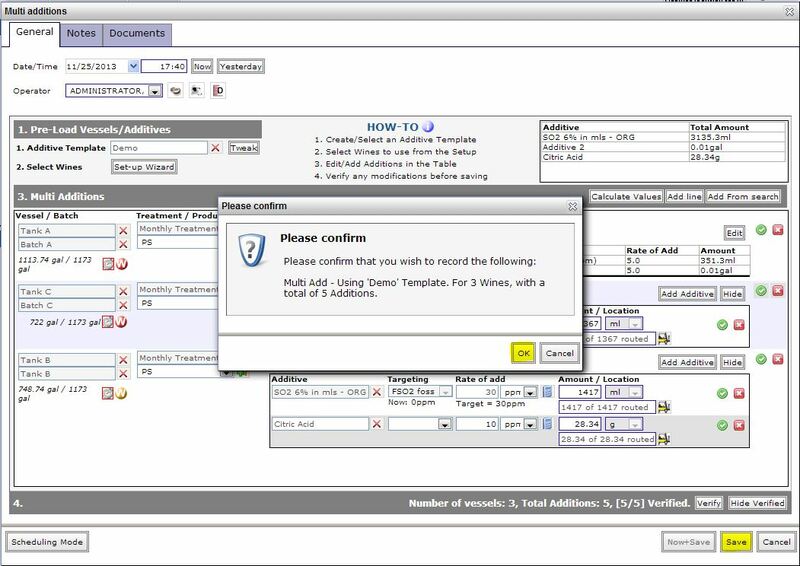 Verify checks each entry in the table and highlights any errors as well as updating the Verified information. The ‘Hide’ functionality hides the additions by showing a summarized additive table. A wine’s additive information can only be hidden if it is verified (no errors). By clicking Hide Verified all of the wines that are verified will be hidden. It is especially useful if the operation has many wines, as it’ll help single out the wines that need to be modified. The Hide Verified button toggles between ‘Hide Verified’ and ‘Show all’. Save the operation once you are done modifying the table and all the entries are verified.